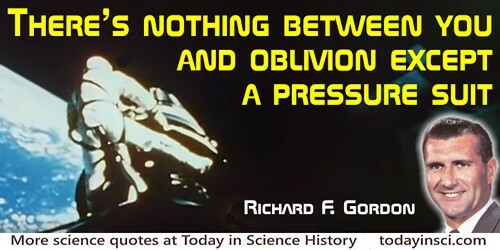 Geology is the study of pressure and time. That's all it takes really, pressure, and time. Narration by Red (Morgan Freeman) in movie The Shawshank Redemption (1994). Screenplay by Frank Darabont, from short story by Stephen King, Rita Hayworth and Shawshank Redemption. That there is a Spring, or Elastical power in the Air we live in. By which ελατνρ [elater] or Spring of the Air, that which I mean is this: That our Air either consists of, or at least abounds with, parts of such a nature, that in case they be bent or compress'd by the weight of the incumbent part of the Atmosphere, or by any other Body, they do endeavour, as much as in them lies, to free themselves from that pressure, by bearing against the contiguous Bodies that keep them bent. New Experiments Physico-Mechanical Touching the Spring of the Air (1660), 22. Of the wide world dreaming on things to come. St. Paul and Protestantism (1875), 155. We took on things which people might think would take a year or two. They weren't particularly hard. What was hard was believing they weren't hard.